A. Look at an outfit and take cues from the details and fabrics to figure out who would wear it for what type of event. B. When making an outfit, to plan out the details around a real or imagined person or event. But then, I’m a costume geek, so I guess that’s one of my quirks. But that means that a lot of thought and planning went into this outfit. There are limitless options when it comes to trimming a Victorian outfit, so it was hard to narrow it down to a few choices, let along decide on one. Option 1– Yellow silk pleating banded along the outer two inches of the collar and cuffs. It would give a pop of color and reflect the pleating detail seen on the skirt. However, the pleats would need to be sized just right, or even angle pleated like those on the skirt. 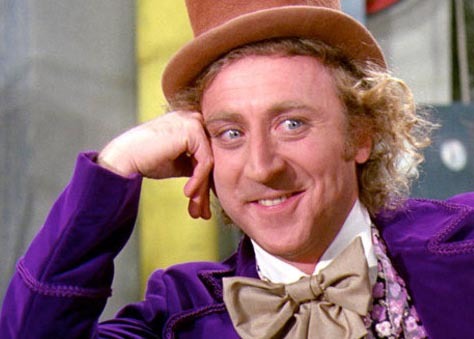 Plus the lapel is actually already yellow silk, so what would I even do there?- Additional yellow, but pleated? Pleat the entire collar? I made two rows of knife pleats for the cuffs but ended up feeling like they were too clunky for the cuffs. The beaded hem I insanely decided to make after everything else was done. * My best collar and cuff advice is to check and re-check your stitching lines before clipping and pressing your seams. I decided to make a yellow silk pleated train coming down the back for the skirt, banded in by three V-shaped blue straps. I like to see an unexpected detail when someone turns around- a cutout back, a pop of color, etc. so I thought the waterfall style at the back would provide a Wow moment. Pleating the train was… interesting. 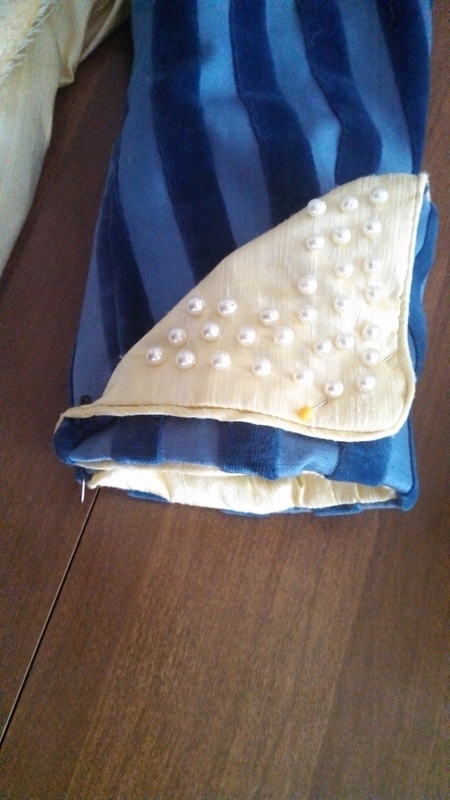 I can’t say it turned out just how I imagined it, but one tip I can offer is to consider the benefits of tacking down your pleats to a certain point, to keep them where you want them. I wanted a somewhat French inspired look without falling into the aniline trap of an in-your-face blue and yellow outfit, so I chose a deep royal blue that’s quite somber, though not navy. Paired with it is a very delicate pale yellow silk. It’s a good thing too, because as complementary colors, they still look more vibrant next to each other than others would. Plus, the blue fabric is completely matte, so the only shimmer is the soft characteristic sheen of the silk and the occasional sparkle from the beaded accents. The colors indicate a woman who is confident and stylish but not a slave to (aniline) trends. 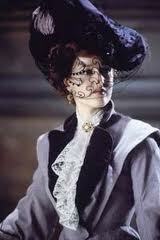 The hand-worked details on her dress, in conjunction with machine stitched tailoring, indicate an expensive purchase. The very nature of the trims hint at a practical nature, as they are primarily menswear-inspired buttons, tabs and pleats rather than the expected flowers, gathers and ruffles. 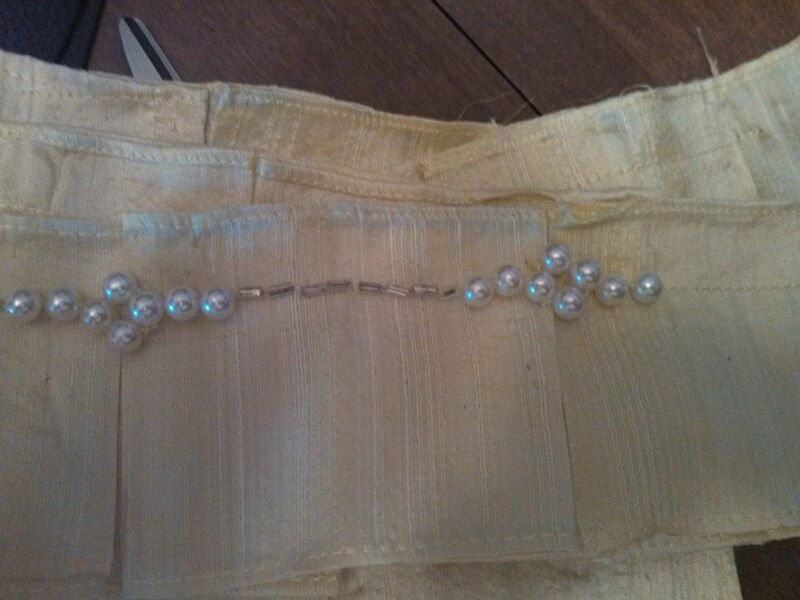 And yet the beading and pearl trim keeps it classically feminine. The simple lines and the sturdy fabric could indicate it is a day dress, but the neckline is very low for a walking dress and the beaded details and waterfall train are less than practical for something like a travelling suit. 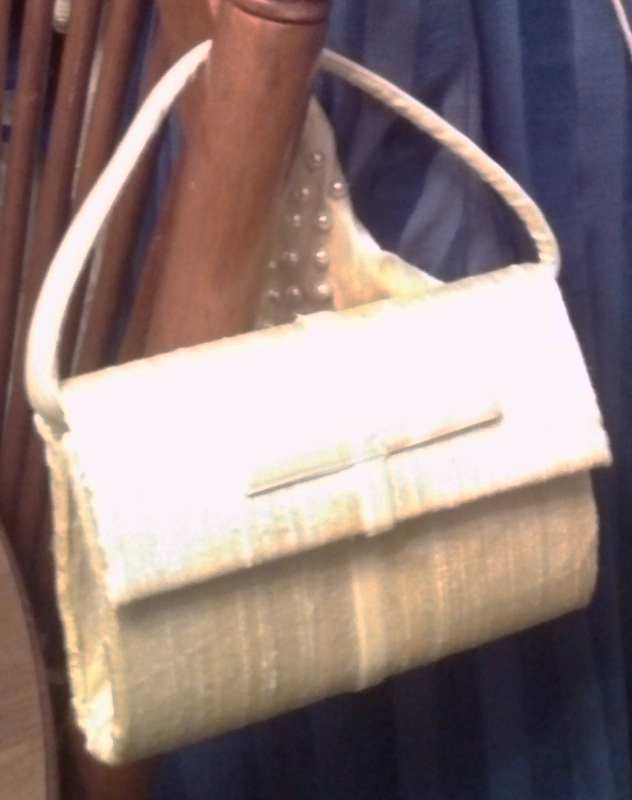 Little silk purse, a re-covered resale find. My choice of accessories is deliberate as well. 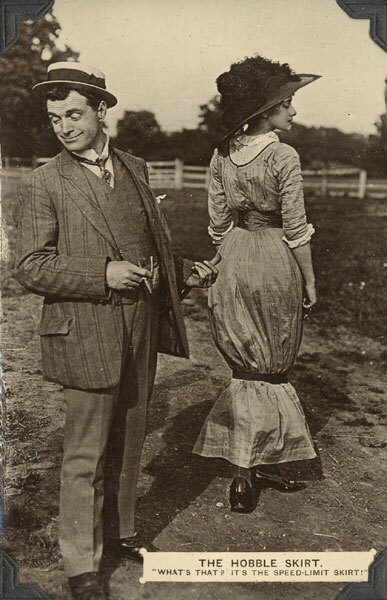 A hat indicates an outing, whereas a ribbon or floral decoration in the hair would be more appropriate indoors, and I carry a purse instead of a parasol- a practical and “active” accessory indicating either possession of my own money or at least the authority to spend it independently. Therefore, the lady who wears this is attending a fancy daytime event, undoubtedly with a chaperone but still wishing to stand out. It could be a shopping expedition in a progressive city like London, an art salon exhibiting the controversial art of Toulouse Lautrec or Dante Gabriel Rosetti, or perhaps a daytime activity at a high-profile event like the Congress of Vienna. Or even a House of Mirth style seasonal gathering at the estate of a gracious host, where the day dress may have to serve for several events before one could change for dinner. 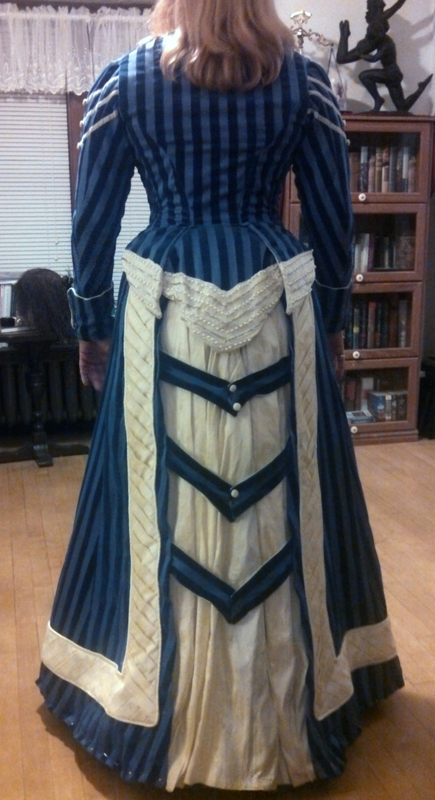 The back of the Teslacon Dress- More pictures will be added after Teslacon! Wherever the lady is going, the dress is done and I’ll be moving on to other creations in my posts- I hope you’ve enjoyed this little saga! 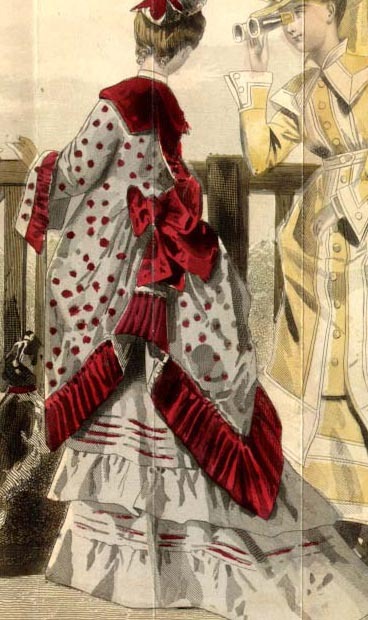 Next Post: The 1-Day 1860’s Corset! 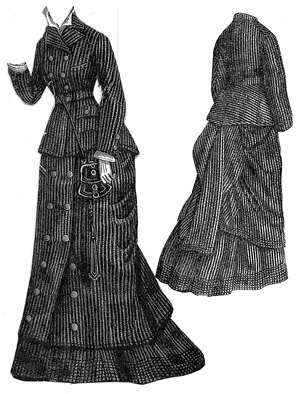 *Sources include: Victoriana.com, Metmuseum.org, and around 13 years of general historical costuming research.